Harleigh Cemetery is a historic cemetery located in both Collingswood and Camden, New Jersey. Harleigh Cemetery and Crematorium is one of the oldest cemeteries in New Jersey. Named Camden County Veterans Cemetery in 2007, the current President is Louis Cicalese. 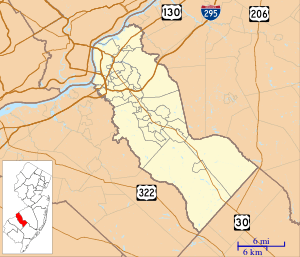 Harleigh cemetery is over 130 acres (0.53 km2) of lush mature grounds situated on the Cooper River a short drive from Philadelphia. The cemetery has been listed on the New Jersey Register of Historic Places since 1995 (as ID #2829). David Baird (1839–1927), United States Senator from New Jersey from 1918–1919. David Baird, Jr. (1881–1955), United States Senator from New Jersey from 1929–1930. Ella Reeve Bloor (1862–1951), radical labor organizer. William J. Browning (1850–1920), represented New Jersey's 1st congressional district from 1911–1920. Albert E. Burling (1891 - 1960), Justice of the New Jersey Supreme Court from 1947 to 1960. George C. Burling (1834–1885), Union Army officer during the American Civil War, serving mostly as Colonel and commander of the 6th New Jersey Volunteer Infantry. Carl McIntire (1906–2002), founder of and minister in the Bible Presbyterian Church. William Joyce Sewell (1835–1901), United States Senator from New Jersey from 1881–1887 and 1895–1901. John F. Starr (1818–1904), United States Senator from New Jersey from 1863–1867. Walt Whitman (1819–1892), Essayist and Poet. Charles A. Wolverton (1880–1969), represented New Jersey's 1st congressional district from 1927–1959. ↑ "Exploring the Architecture and Rituals of Nineteenth-Century Mourning". Historic Camden County. October 28, 2002. Retrieved 2007-08-21. The Society's headquarters in Parkside is located just a stone's throw from the heavily wooded grounds of the 117-year-old Harleigh Cemetery and the two facilities cooperated in the day's activities. "Death records and the social rituals surrounding death are among history's most important touchstones," said Society president Richard Pillatt. "And here at Harleigh, in Camden County, we have an extraordinary example of a Victorian-era garden cemetery that was actually designed as a park -- a place of public entertainment." ↑ New Jersey and National Registers of Historic Places: Camden County, New Jersey Department of Environmental Protection, Historic Preservation Office, last updated August 6, 2007. Accessed August 26, 2007. ↑ David Baird, Biographical Directory of the United States Congress. Accessed August 16, 2007. ↑ David Baird, Jr., Biographical Directory of the United States Congress. Accessed August 16, 2007. ↑ "Rites For Mother Bloor; Funeral of Communist Leader Held in St. Nicholas Arena", The New York Times, August 15, 1951, p. 24. "Her body will be taken today to the Harleigh Cemetery, Camden, NJ ..."
↑ "Albert E. Burling (1891 - 1960) - Find A Grave Memorial". Retrieved 25 June 2016. ↑ William Joyce Sewell, Biographical Directory of the United States Congress. Accessed August 16, 2007. ↑ John Farson Starr, Biographical Directory of the United States Congress. Accessed August 16, 2007. ↑ Campbell, Douglas A. "Memorial Dedicated To Camden Poet Friends Of Nick Virgilio Raised Money For The Monument. Yesterday They Read Haiku At His Grave. ", The Philadelphia Inquirer, June 24, 1991, p. B01. Accessed September 24, 2007. "Haiku, the poetry Nick Virgilio wrote, is filled with imagery. Yesterday at Camden's Harleigh Cemetery where, under heavy skies, a Virgilio memorial was dedicated by 100 friends, the images abounded." ↑ Walt Whitman House, Visit South Jersey. Accessed August 16, 2007. "Not far from the poet's house is the historic Harleigh Cemetery, his final resting place." ↑ "I Hear America Raking. My Strange Visit to Spiff Up Walt Whitman's Camden, N.J., Tomb.". The Washington Post. September 7, 1997. Retrieved 2007-08-21. The cost of the crypt was $4,000 -- not an insubstantial amount, considering Whitman's house in Camden was worth $1,750. On the day of the poet's funeral in March 1892, his body was taken by carriage two miles (3 km) from his home at 328 Mickle Blvd. to Harleigh Cemetery, where 4,000 people gathered for a jubilant celebration of his life. The abandoned building across from Harleigh Cemetery seems to represent most of Camden: cement, quiet and somewhat desolate. However, the cemetery -- by Camden standards -- is tempting. At first glance, Harleigh -- oddly enough, seeing that it's a cemetery -- is surprisingly alive. The grass, although uneven, is green, and many of the trees are full and robust. Two birch trees near Whitman's crypt provide ample shade from the sun as Neil and I begin our work under a summer-blue sky. ↑ Charles Anderson Wolverton, Biographical Directory of the United States Congress. Accessed August 16, 2007.